Ok, so you’ve got an awesome design project and you’ve decided that you’d like to avail of my 3D Visualisation services. Even though I cater to a range of design disciplines, the process I follow in order to create 3D visuals stays pretty much the same. To stop your 3D Visualiser (me) from doing THIS at various stages of our interactions, I’m going to provide a few top tips. These tips are based on my experiences with my clients over the last few years and should make the whole process for both the Designer and 3D Visualiser (me) much more smooth and seamless, so that by the time I present the final 3D visuals, our working relationship should resemble something a little closer to THIS. The biggest obstacle to productive Designer/3D Visualiser relations is the Designer’s lack of understanding/knowledge when it comes to the 3D Visualiser’s processes when constructing the 3D model and producing a photo-real image. I’m not judging; I completely understand that most Designers will not be aware of the technical intricacies of the 3D Visualiser’s role. However, repeatedly disregarding the 3D Visualiser’s process usually results in the Designer having unrealistic expectations. This contributes to frustration, disappointment and undue stress for both parties. With the above in mind, it’s also crucial that the 3D Visualiser takes the time to communicate the process clearly, making sure that the Designer is aware of all stages of the 3D Visualisation process, including any limitations. It’s all about managing expectations, right? My advice to Designers, is to LISTEN to your 3D Visualiser when they’re explaining the process and ensure that you always factor in the 3D Visualiser’s workflow. If there is something you’re unsure of, ask questions! Try to understand the process, it will only serve to benefit you for future projects. I’ve found unrealistic deadlines (set by the Designer) to be the most frequent obstacle to getting a project off the ground (i.e. I’ve had to turn clients away, which I HATE doing), or the most stress inducing factor for me, as the 3D Visualiser, when trying to produce a 3D visual in a very quick turnaround time. There is no special ‘start’ button when producing a final photo-real image (unfortunately). It takes time to construct a 3D model, apply the textures, lighting and conduct test renders before the first draft render is forwarded to the Designer for approval. 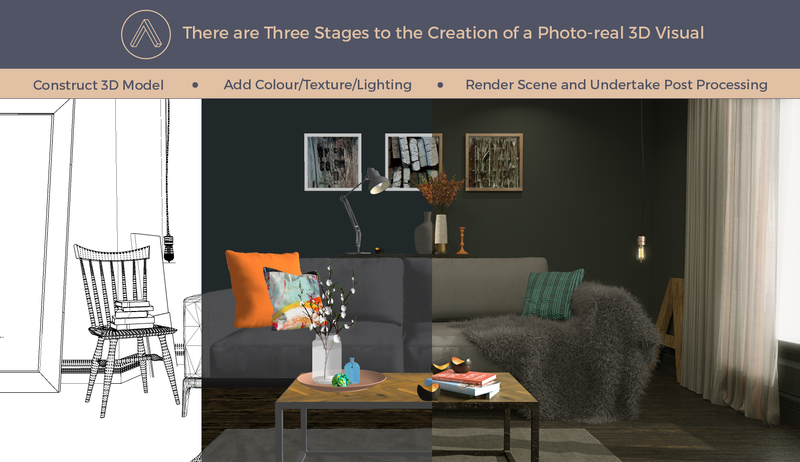 In my mind, there are two reasons why a Designer might have an unrealistic deadline: he/she has made the decision to avail of 3D Visualisation at the last minute, or he/she has lack of knowledge/disregarded the 3D Visualisation process (see point 1). As soon as you (the Designer) have decided to use 3D Visualisation to present your design concept, contact the 3D Visualiser immediately! If your space/interior is large and contains complex design elements, it will take longer to construct the 3D model. After I’ve created the 3D model, I need to ‘render’ it so that it looks ‘real’. This also takes time. Depending on the space, it could take two hours, or twelve. Then I conduct ‘post-processing’ in Photoshop to enhance the image and make corrections. Sometimes the post-processing can take an hour or two, depending on the scene. As a guideline, you should be contacting me at least a week before you need the final photo-real image. 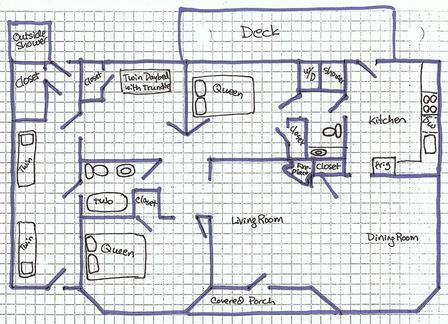 If there are multiple interiors, you should be contacting me at least 10 days beforehand. This doesn’t mean that I won’t be able to present the final 3D visual within a shorter timeframe but it’s important for Designers to remember that there are times when I’m working on more than one project. I need adequate notice in case I’m working on multiple commissions. Makes sense, right?! The biggest and most damaging aspect of rushing a 3D Visualisation commission is that the quality will undoubtedly suffer. As the Designer, you want your designs to be conveyed accurately and in a visually captivating manner. As the 3D Visualiser, I want to ensure that my work has been presented to the highest standard possible. It’s a no brainer – give the 3D Visualiser enough time to do your designs justice! The 3D Visualiser requires detailed information regarding all aspects of the design concept. This includes floor plans, furniture layout, (including all necessary dimensions) and either website links and/or images of the furniture/designs to be incorporated. See my previous post setting out more detail about my 3D Visualisation process and information requirements here. As the Designer, you should have all of the design finalised before you approach me. You should also provide 80% of the information I require before I commence the project. I’m more than happy to make a start on the 3D model while a Designer is sourcing the remaining information. If you do not have the design finalised before I make a start on constructing the 3D model, this will cause undue delays and may increase the final fee (if you’ve decided to make a number of structural/design changes after I’ve constructed the model). However, I do include one round of minor amendments in my fee (colour/texture changes or re-positioning of objects). I know that if you haven’t used 3D Visualisation previously, the thought of engaging a 3D Visualiser can seem daunting but please try not to be discouraged from incorporating 3D Visualisation into your presentations. Once you’ve gotten to grips with the requirements (and I always guide and advise my clients, heck I even provide a checklist to ensure the process is as painless as possible), you will be astounded at the amazing results of a photo-real 3D visual and more importantly, your client will be astounded too! Interesting post! The thing to remember is that not a few clients (and I include designers) cannot think in 3D and this is where the information gap can occur. When trying to explain 3D thinking to anyone I try to get people to imagine they can feel the object or space in their hand and that they can ‘touch’ its shape, texture and weight. Not easy to explain either! Hi Brian! Thanks for your comment. You know, you’re so right. A lot of people find it difficult to think in ‘3D’ but in my experience, it’s not really the 3D environment that has caused issues with my interactions with my clients. It’s more about the amount of time required to present the final image (unrealistic deadlines) and lack of information in order for me to create the model. I’m kinda hoping that if I continue to raise awareness and keep prospective clients (and current ones!) informed, it might help to make the overall process (for both of us) relatively smooth! Fingers crossed! Sometimes it isn’t even about the final image. There are clients who genuinely believe that there is a magic button to press and out comes the pic! It does go back to general awareness of what 3D vis is and how you arrive at the finished product; you have mentioned before, I believe, that here in NI we are far behind the rest of the UK. Any clients that I do have are all in GB. Same here, Brian. Designers in NI seem to find 3D Visualisation either an unnecessary expense or are afraid of it. We’ll catch up. Eventually! Great blog post, Anita. By changing a few words here and there, this post could be made into a general list of principles when working with any creative supplier, from writers to content developers of all kinds. The problems are the exact same: lack of sufficient input at the start, inexperience either understanding your job/how it works/what you spend your time on/how much time things take. Thanks Dawn, glad you enjoyed it. I completely agree, many Creatives and service providers probably experience the same issues but I’ve kept it relevant to my field for my followers/readers 🙂 I hope you are well, chum!